Much to my extreme embarrassment I will admit right here and right now that my original, self-imposed Pinterest Challenge involving the frame collage in the shape of a heart remains unfinished. I will say that it is at least mapped out on the wall and about half the frames are hung. They still do not have any of the final photos added, but we are getting there. I hope…. Since that project turned out to be such a bummer, I decided to share posts of a few projects inspired by things I saw on Pinterest, that I actually finished. Just for fun, I will be including the failures along with the successes, so enjoy Post #1! I pinned this cute pumpkin idea from BHG.com. Then talked to a friend about it a few days later. 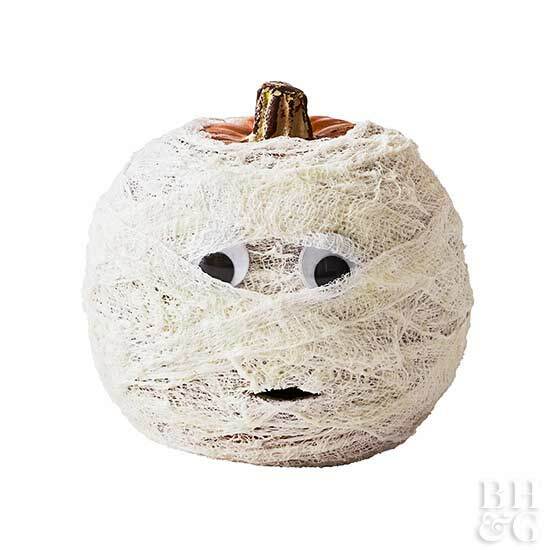 She mentioned how the gauze on a wreath might make for a cool mummy inspired door decoration. On the long ride home from that visit with her I had plenty of time to think and ended up deciding to go for the door décor instead of the pumpkin. Thanks for the idea, Whitney! While browsing the $1.00 bin isle at Target I found these small foam wreath forms sold in sets of three. Combined with some muslin that I had in my fabric stash, I figured I could come up with some mummy rags. Tearing 2 inch strips from about 2 yards of muslin proved to be just the right amount of clothes for these guys. I wrapped, wrapped and then wrapped some more. During this part of the process I also wrapped the three together in a layout that I thought looked right for our front door. I secured the ends with glue and added sewing pins at the ends of the pieces that held the different rings together just for extra security. I dug around in my button stash for some extra large eyes. I ended up using dark green, brown and black 1.25 inch buttons for these goofy guys. After wrapping the fabric around each wreath I just wrapped random strips around the wreath centers to help create the rest of the faces. This takes some rearranging until you get just the right angles for the look you are going for. Once I thought I had it all figured out, I glued the buttons in place. The resulting wreath is a bit more jovial than scary, which is pretty much what we are going for around here with the little ones. So, here is the first success I had in a while with Pinterest projects and it got some good laughs during the month of October.